Shopping for Teenage Mutant Ninja Turtles Roleplay? Teenage Mutant Ninja Turtles weapons! Light-up finger weapons that you control! Act out Donatello, Leonardo, Michelangelo, or Raphael's skills! Display box contains 12 individually packaged weapons. What is the Turtles' favorite thing besides pizza? Their weapons, of course! 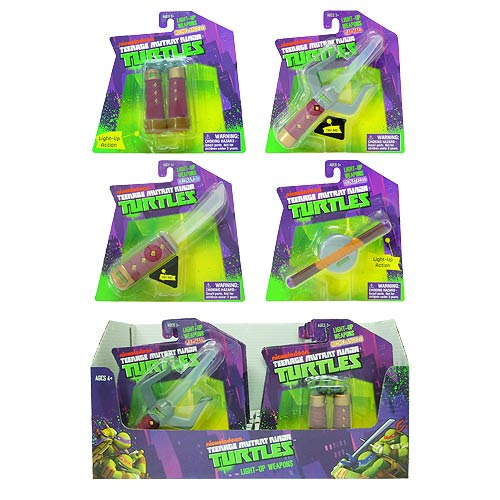 Teenage Mutant Ninja Turtles Light-Up Weapons let you act out Donatello, Leonardo, Michelangelo, or Raphael's skills with light-up finger weapons that you control with your own hands! Ages 4 and up! Requires 3 X “AG13 (LR44)” batteries, batteries included!